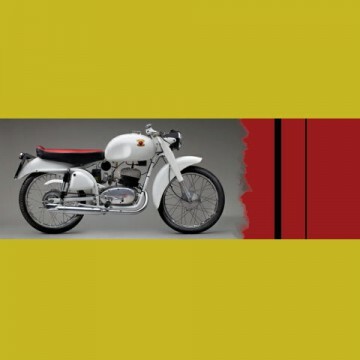 Exhibition on now at SFO of fine old Italian rides, called Moto Bellissima: Italian Motorcycles from the 1950s and 1960s. If you’re changing planes in San Fran, skip Starbuck’s and feast your eyes on these bikes instead. That’s a ’55 Moto Rumi “Raid” above, and a ’52 Motor Devil “Gobetto” below. (Gobetto means “hunchback” in Italian.) SFO really does contain a museum, btw. A real, good one. A bike can be a thing of beauty, and nobody figured that out faster than the Italians did (surprise surprise). After WWII their motor industry was in ruins, people were short of money and raw materials, but mobility was a MUST! Enter, a generation of bike-making entrepreneurs and designers who sped in to fill the gap. Just five years after the war there were 220 (!!) Italian motorcycle makers showing their steeds of steel at the 1950-51 Milano Motorcycle Exhibition. Tons of taste, and innnovation were unleashed and the thrill lasted all the way through the 60s, and what a thrill. Still. These rides are art. Synaptic Strap™ No. 1: HMT Bali. I hadn’t considered the virtues of vintage motors ’til I moved to Bali in 1995. While writing an article on the Bali Classic Motorcycle Club (Himpunan Motor Tua or HMT), I went on a two-day club ride encircling Bali, and fell hard for the sight and sound and indescribable magic of their classic bikes (from a 1926 Harley to “Frankenbikes” cobbled together with bits of Indians BSAs Nortons and plumbing equipment). Synaptic Strap™ No. 2: Deus Bali. Wonder of wonders, what sprung up a couple years ago in the rice fields of my neighbourhood, but Deus Ex Machina Bali. The thrill is back. Deus isn’t a museum, either. Their custom-classic bikes are for sale. If Deus bikes are mindblowing enough for Mrs. Damien Hirst a.k.a. Maia Norman (she bought the one I wanted but thought I couldn’t afford), then they’re mindblowing enough for anyone. Maia is a fashion designer, with a mindblowing new collection for her label, Mother of Pearl.